Thank you for your interest in the Catholic Charities Adopt a Family program! We hope that sharing the holidays with our families will help bring the warmth and joy of the season to you as much as it does to them. Adopt a family who lives in the Russell, Shawnee, or Portland neighborhoods and who receive services from our Sister Visitor Center. SVC provides emergency assistance (food, clothing, LG&E, rent) to residents in these neighborhoods. Adopt a family from our Mother Infant Care. Single mothers or 2 parent households who enroll in this program learn about pre-natal and postpartum care for their infants. Adopt a refugee family from Migration and Refugee Services. For many newly arrived refugee families, this is their first Christmas in the U.S. Here is some additional information about the program or click here for a sample assignment form. We ask sponsors to buy a maximum of 2 gifts per person in the family. This is to ensure that the families are not inundated by gifts and can fit them in the apartment/house comfortably. This also shows families that the true meaning of the holidays is connection and relationship, not material items. We ask that sponsors not purchase actual clothing for refugee and Mother-Infant Care families unless it is something that can be easily sized by age (like baby and toddler clothing) or winter items. We have found that in the past, much of the clothing bought for our families didn’t fit. If you are sponsoring a refugee or Mother-Infant Care family, we ask that you purchase gift cards to clothing stores that families can use to select their own clothing after trying it on. If you are sponsoring a family from Sister Visitor Center, sizes will be listed for you to purchase clothing for. 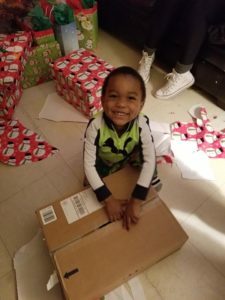 The general wish list is a collection of items that most families request, and sometime we include items specifically asked for by families. Please contact Shelley Dewig at 502-637-9786 for more information.